The Mountain Legacy Project (MLP) is an interdisciplinary collaboration focused on exploring change in Canada's mountain environments. Utilizing over 120,000 images taken by land surveyors from 1861 - 1953, MLP field teams seek to re-photograph these images as accurately as possible and make the aligned historic / modern pairs available for further exploration. MLP researchers also design, deploy, and utilize visualization software to analyze and describe change (and similarities) in the image pairs. Anyone with a modern web browser can access the images and utilize MLP's visualization tools. In 1911 a survey of the Mt. 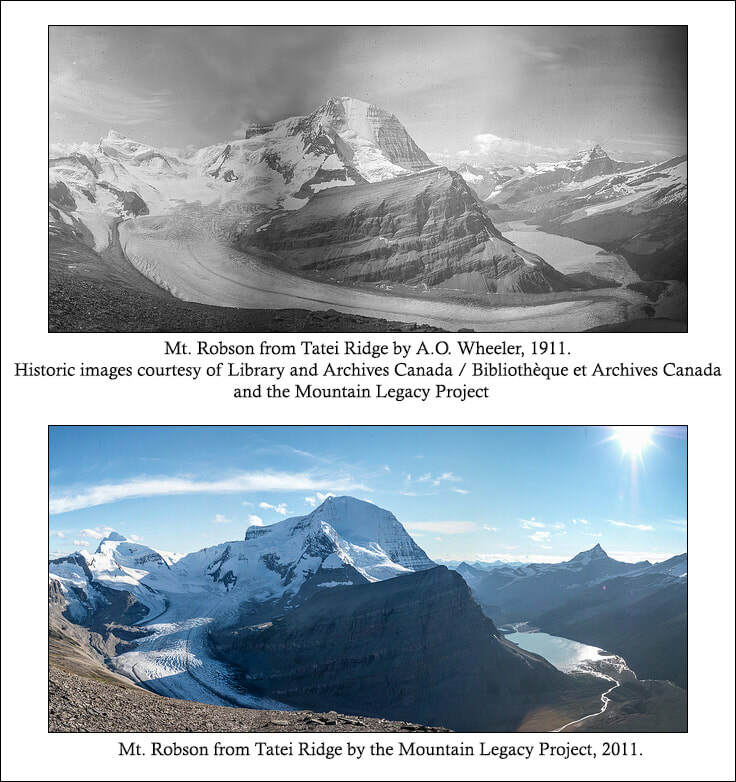 Robson area was undertaken by a team led by Arthur Wheeler - land surveyor, map maker, and mountaineer. As part of the process 237 images of what is today's Mt. Robson Provincial Park were captured on glass plate negatives. In 2011 / 2012 MLP field teams went into the Park and rephotographed 22 of these images. As part of the Living Labs Program, MLP proposes to leverage both the historic images and the repeat pairs to demonstrate landscape level change in Mt. Robson Provincial Park. Figure 1 is an excellent example of landscape level change across a century in the Park. An assessment of the existing Mountain Legacy collections associated with Mt. Robson Provincial Park. These include historic survey images (1911) and repeat images (from 2011 and 2012). The result is an ordered inventory of historic and repeat images, and a priority list from the 1911 survey or digitization at high resolution in the future by Library and Archives Canada / Bibliothèque et Archives Canada (LAC/BAC). Identification of key landscape / spatial features of concern to Park management and/or that reflect BC Parks mapping standards. The creation of segmented and classified images for 6 to 8 historic/modern image pairs from within Mt. Robson Provincial Park. Each image pair is further examined with custom software built in-house to analyse the patterns of change evident in the century between photos. This rich visual dataset shows relative degrees of change in forest composition and other landscape features. This website -- to give background, display the image pairs and their analyses, and introduce a series of image visualization tools for easy use by BC Parks, other researchers, and interested members of the public.